Birds can seemingly survive anywhere. Whether it be Emperor penguins incubating eggs in the middle of the Antarctic winter or the newly discovered Desert tawny owl braving the Arabian nights, birds have conquered some of the most challenging and inhospitable corners of the globe. There is clearly some evolutionary advantage to colonizing extreme environments; For example, competition from other species is minimized. However, adaptations or specializations that confer advantages under one set of circumstances might prove detrimental under others. It is with this backdrop that I want to marvel at the apparent adaptability of the Horned lark. 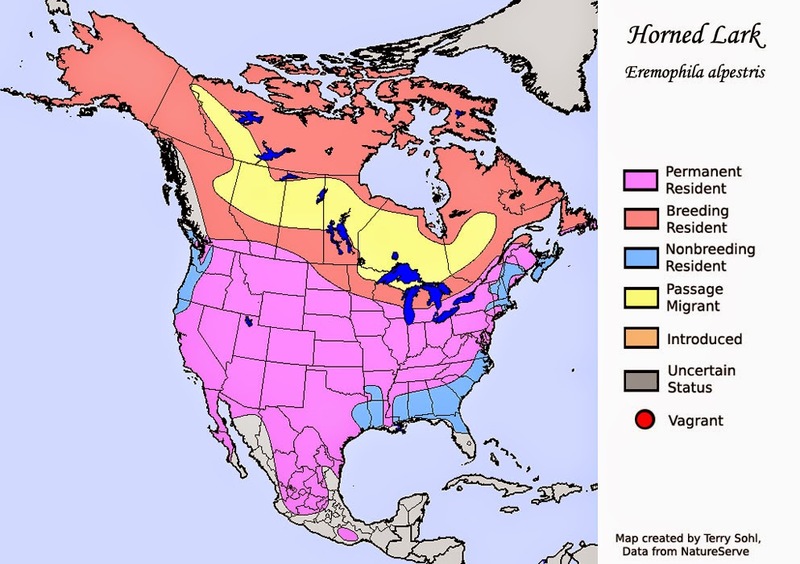 As you can see from the above map, Horned lark occurs just about everywhere in North America that suitable habitat can be found. 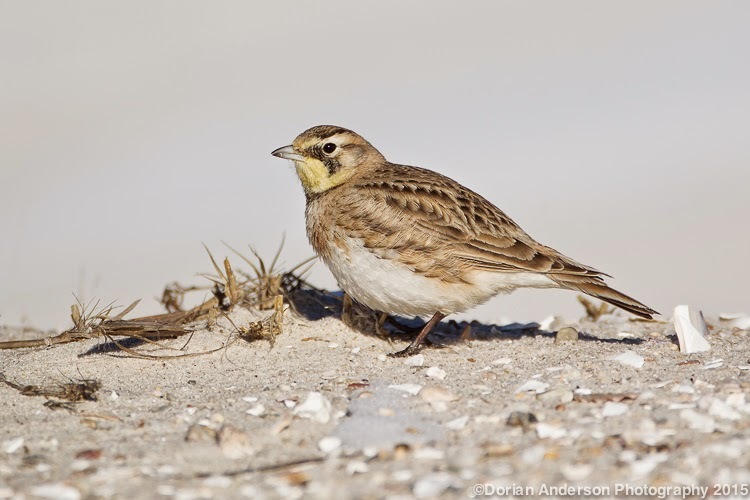 Suitable habitat for Horned lark is any flat, open area - farm fields, tundra, beaches, etc. Eremophila alpestris is also widely distributed across Eurasia where it takes the common name of Shore lark. 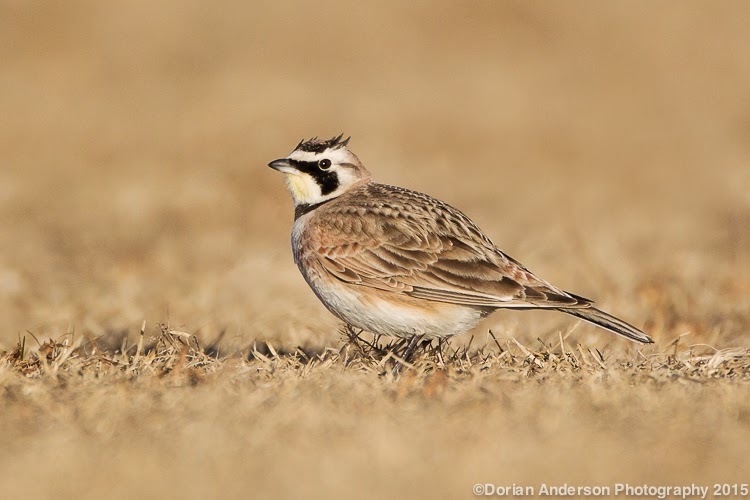 Given its incredible distribution, the Horned/Shore lark does not appear to face any major conservation challenges in the future. Being a generalist does have its perks! Thinking back to last year and Biking for Birds, I recall that I saw my first Horned lark on January 1st in Massachusetts. Temperatures in that region in that first week of January barely broke freezing, and on some nights the mercury dipped to -20F. Many birds can survive in extreme cold, so at face value this information isn't terribly notable. It was when I reached Northern Arizona that the adaptability of the Horned lark really hit me. I was biking through an incredibly arid region of the Navajo Nation near Kayenta. Vegetation was essentially nonexistent, and water was nowhere to be found. The temperature on that day was 95F. The red, rocky desert that stretched out in all directions could easily be mistaken for the surface of Mars as depicted in some science fiction film. Despite all of this, I found what appeared to be a healthy population of Horned larks in this seemingly lifeless landscape. Comparing this setting with that of January in Massachusetts, I was astonished at the range of temperatures in which the Horned lark seemed to thrive. I was reminded of this adaptability this morning as I crawled across frozen sand to capture this photo. Anyway, this is just some food for thought. Hopefully you'll be able to appreciate the Horned/Shore lark in new ways moving forward! Here is my current view from Farmingdale, Long Island, NY. Yep, that's my car covered in 18" of snow. After spending Jan 8-24 recovering in Philly, I headed up to NYC this past weekend. I will be using NYC as a base of operations for the next few months while I sort through more permanent housing/employment options in the upcoming weeks. I had planned to spend this week birding/photographing on Long Island before setting up permanent shop in the city next week. Unfortunately, this enormous storm has crushed my plans to bird Jones Beach, Robert Moses, Shinnecock, Montauk, and other Long Island hot spots. The consolation prize is that I am snowed in with a professional chef, so it could be much worse! I might be able to make it out tomorrow, but that's all in the hands of the plows. I am sure that I can do some birding by the weekend; all I can do is sit tight and eat up. I found this Northern pintail tucked in with the resident Mallard and Canada geese at one of my boyhood birding haunts, Valley Green in Fairmont Park (Philadelphia). 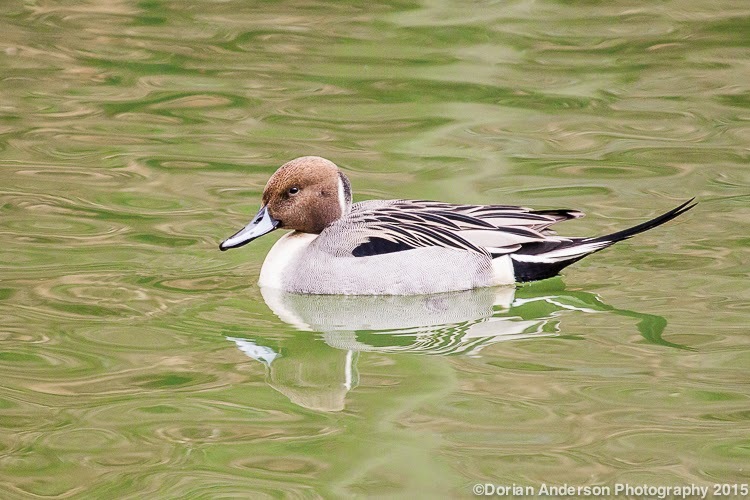 This is a nice find for this locale as pintail usually prefer more open water to the tight, tree-lined confines of the relatively narrow Wissahickon Creek. Sonia and I first observed this bird on Wednesday. As we were just out to catch a quick breath of fresh air, I didn't have my camera with me. I returned the on Thursday to see if Mr. Pintail had lingered. He was indeed present, but like the previous day he would not permit terribly close approach. With some patience, I was eventually able to grab a few frames of him. The light was super flat, but I am happy with the results. While bright sunshine generally makes for more vivid colors and prettier images, flat light actually shows the natural colors of the subject bird more accurately. I normally try to take a very low angle when photographing waterfowl. Because the light on this day was so flat, I decided to shoot from a slightly elevated angle. This would help to capture some of the shimmer on the water's surface. I thought this would help make the image a bit stronger by adding at least some contrast and depth to it. More action would have been welcomed, but he was content simply to float in loose circles. I am happy with the image nonetheless. A few days go I read an online report of a possible/probable Kelp gull in Pittsburgh. This is an incredible rare wanderer to the ABA area with only a handful of recognized sightings scattered around the country. Similar to Great Black-backed gull, Kelp gull can apparently be differentiated from the former by its smaller bill, greenish/yellow legs (versus pink), and darker mantle. I say apparently as I have no first-hand experience with Kelp gull and had to resort to the internet for this information. I am sure there are other field marks, but I just wanted to highlight what appear to be the most obvious for this discussion. When I first read the post about the gull, I was initially very excited. Here was the chance to add a fantastic bird to my Lower 48 list. By chase standards, the 600-mile, round-trip drive is significant but hardly insurmountable. Gas is very cheap at the moment, so finances surely wouldn't hold me up. I am unemployed after my big year, so time isn't really a huge constraint either. I figured I could leave Philly at 4am, reach the bird's area by 10am, bird until dark (if necessary), and be back in Philly by midnight. I've certainly pushed harder than this in the past. A specific non-stop, overnight drive from Hatteras, NC to Cape May, NJ for Whiskered tern (which I missed) springs to mind. I did that drive directly after stepping off of a 10-hour pelagic trip that ran from 7am-5pm. I literally got off the boat and drove right though the night on zero sleep. I finally slept for 2 hours in the Cape May Point State Park lot, birded until noon, then drove the remaining 2.5 hours back to Philly. Anyway, you get the idea. So, given the relative financial, temporal, and geographical accessibility of the very rare Kelp gull, why didn't I chase it? I need here to say that I am sure I will chase at least some birds in the future. If a Hoopoe shows up in New England, you can bet I'll be the first one on the road. This species is so radically different from my local avifauna that I can justify the chase purely on aesthetic grounds. However, I cannot honestly say the same thing about the Kelp gull; it would be purely a tick on my list. The initial knee-jerk response to chase everything is from what I am working to wean myself. While I see the potential pitfalls of ranking rare species along a desirability curve, this is exactly what we do when we prioritize visiting rarities over our own resident birds. We must remember that birds are ultimately more than ticks on a list. Right now, I am more interested in enjoying and photographing my local birds with a minimum amount of time in the car and a minimum amount of gas burned. This is the first reason I let the Kelp gull go. The second reason is a bit more complex. My current perspective is undeniably shaped by the fact that I saw 617+1 species of birds on a bike last year, many of these very rare in North America. What made each of the species so special was how hard I had to work for them. 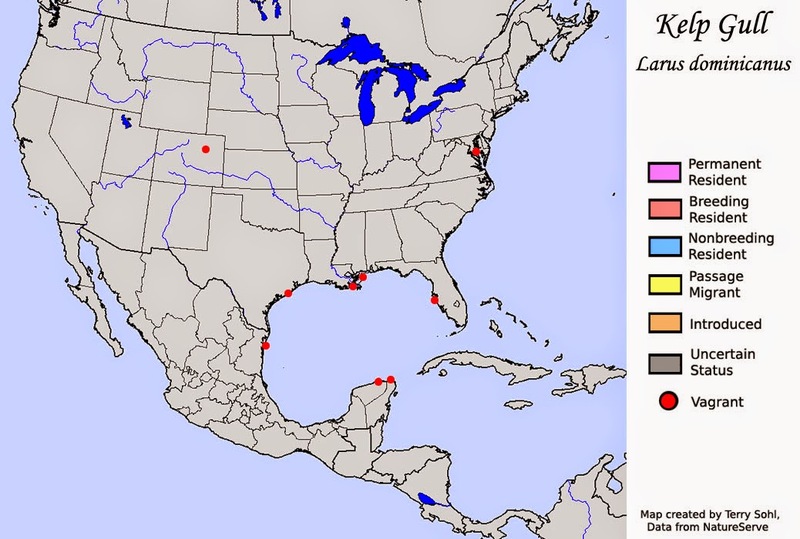 To get Rufous-backed robin, I had to detour 300 miles over 3 days! I really, really earned earned that robin, and I can say, without hesitation, that I would not feel the same way about the Kelp gull were I to drive to tick it. I felt similarly when I let a Pink-footed goose go last week. That bird was only an hour's drive from me at that time! My perspective might change as I become further removed from the bike adventure, but right now using a car to tick birds is just too easy. I understand my perspective on this is incredibly unique. How any birder chooses to bird and/or list is completely up to him or her. A Massachusetts birder recently explained to me, "I hate pelagic trips, but I go because I am afraid that if I don't go I am going to miss something really good." There seems to be this sometimes pervasive feeling that no one wants to be left out of seeing any rare bird. This feeling seems to manifest itself as these knee-jerk response to chase whatever rarities show up in a given area. I enjoy record keeping and listing as much as anyone, but what someone else puts onto his or her list should not change how I approach either my own birding or my own listing. If a person likes pelagic birds, then he/she should take pelagic trips. If not, he/she shouldn't feel left out for staying on shore. Part of the psychology is surely human nature as we are naturally prone to comparison and competition in such matters. If someone is doing a county or state big year, then he/she is wed to chasing everything; I understand it's the sometimes the nature of the beast. Again, let me here state that I am sure I will, in the near and distant futures, use cars for general birding and chasing selected rarities. However, my adventure last year has made me rethink how often and to what extremes I am willing to go with cars to see rare birds purely for the sake of my life list. Also, if you have a Facebook page and enjoyed my adventure last year, you might enjoy 'liking' Gary Prescott's "Biking Birder 2015" Facebook page. Gary is doing a bike big year around the UK. He hopes to find 300 species in his travels this year! It is also worth mentioning that there is a nationwide bike-birding competition in Sweden this year. The ~200 participants are participating at different levels/intensities, and the whole thing is designed more as a collaboration than a formal competition. Post #1 - Welcome to The Speckled Hatchback! Welcome to The Speckled Hatchback! My name is Dorian Anderson, and I am avid birdwatcher, bird photographer, and generally curious amateur naturalist. I have been birding since age 7 (I am 36 as of January 2015), and in those years I have developed a deep appreciation for the natural world and as well as a concern for its health. This blog is my way of sharing this appreciation with you. This blog actually stems from my 2014 biking and birdwatching eco-adventure, "Biking for Birds". During that year, I cycled 17,830 miles through 28 states, observed 617 species of birds, and raised ~$50,000 for bird conservation. The entire 365-day project was petroleum-free as I used only the bike, my feet, and a kayak for transportation. My blog from that project, http://bikingforbirds.blogspot.com, was well received, and I hope to here replicate at least a fraction of the excitement for that project. The birds that I find on my regular birding outings will certainly provide the starting point for most entries, and I will build on this avian base when I can with natural history, relevant conservation efforts, and occasional commentary on environmental policy. 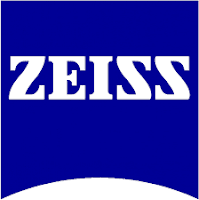 As an avid photographer, I plan to use my images to both generate and augment written content. I hope to explore how humans perceive and interact with the natural world around them, and what changes can be made at both the individual, local, and national levels to make this interaction more sustainable. More than a technical or policy expert, I am an ordinary citizen with what I think is an extraordinary interest in birds and nature. I hope this blog helps its readers to discover or further cultivate their own interest and relationship with nature. The blog derives its name from a childhood experience of mine. Besides birdwatching, ice hockey was my other significant interest as a youth. I played on a local team, and one day the guys were giving me a particularly hard, though good-natured, ribbing. My friend, RP Urban, joked, "I mean what do you do when you go birding? Go out into the woods and just wait for the Speckled hatchback to start peeping?" With this statement RP managed to create a false, but completely believable and humorous bird name that has remained with me for the last 20 years. Although it is purely fictional, the Speckled Hatchback for me represents some mythical bird that I or some other birdwatcher might one day finally glimpse. Beyond birding, the Speckled Hatchback is a metaphor for anything that a person might be searching, whether that be as tangible as a bird or as abstract as the purpose of one's life. We each have our own Speckled Hatchback, and, just as no 2 artists' renderings of the hypothetical bird will be exactly the same, neither will any 2 persons' passions and ambitions. Each of us is looking for something - real or imagined. This blog is part of my search to better understand and appreciate the natural world. I hope you enjoy it. I will not be updating this blog every day as I did for "Biking for Birds". As entries will be less regular, readers might find it helpful to receive Email notifications when I do put up new content. You can do this using the "Follow by Email" feature at the top right of the blog.